The fall of Singapore reflects failure at many levels, but not in the way most observers think. The British had to fight the war they got in 1939, rather than a war that was yet to happen in 1941. Had the Japanese attacked in the Far East before the Germans attacked Poland, the British would have sent their forces east, however reluctantly. But that wasn’t the order of events. The greatest naval defeat the British suffered in World War Two wasn’t the destruction of the Prince of Wales and Repulse in the South China Sea in December 1941, but the fall of France in June 1940. By removing the French fleet from the Allied order of battle, bringing Italy into the conflict with its substantial naval strength, thus making the Mediterranean a theatre of war, and opening the French Atlantic ports to German U-Boats and surface raiders, France’s defeat made the load on British global naval strength more than could be borne. Britain’s strategic over-extension finally hit home. The ‘Main Fleet to Singapore’ policy was a much more credible strategy than hindsight has allowed. Admittedly, there were deficiencies. The British build-up of forces and facilities was too slow, hindered by a combination of financial constraints and well-meant efforts at disarmament. Not enough was done to develop the land and air forces necessary for what would have always been a conflict fought both at sea and on land, notably in Malaya. The Dominions’ support, particularly in fighting forces, never matched the promises made at the 1923 Imperial Defence Conference. But the British did many things to make the fleet deployment work. The logistic challenges were huge, but Middle East oil had not much further to move than it did for forces in British waters. The Singapore naval base build-up was fitful, but by 1928 a floating dock capable of taking a battleship was on station and a ‘Mobile Naval Base Defence Organisation’ was set up which could create an advanced base in the most isolated anchorages. 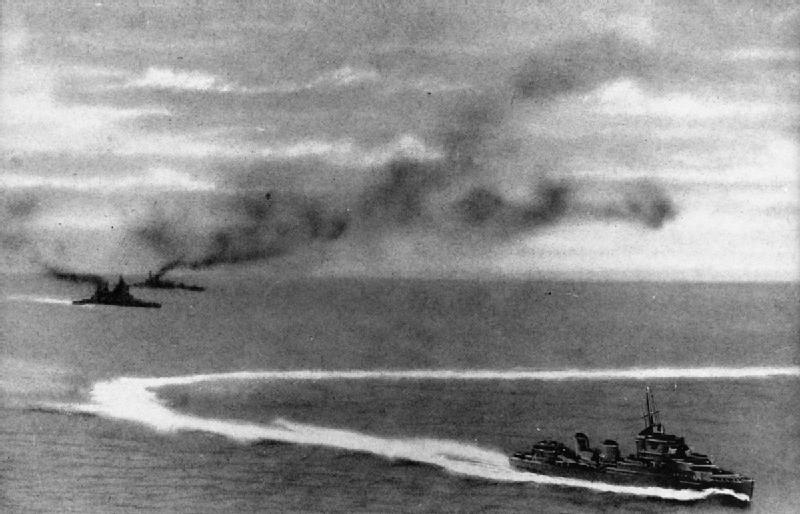 The British Navy regarded the Imperial Japanese Navy as its principal threat. Many assessments of Japanese capability were racist, but some were accurate, displaying understanding of the cultural elements involved. The British feared that the Japanese had superiority in several areas, particularly long range gunnery, and knew they had to evolve their own tactics with the assumption that the Royal Navy would be the weaker force. Thus, at the same time as the Japanese were evolving night fighting techniques, the British were improving theirs. The long range Japanese torpedoes would have come as a surprise, but the British might have done rather well had they met the Japanese at the peak of their own training. The Royal Navy also didn’t underestimate Japanese naval aviation, at least its seaborne side. By 1934 Far East naval commanders were trying to convince their Air Force opposite numbers that they expected Japanese carriers to launch mass air strikes against Singapore from over 100 miles away. What the British didn’t understand, was that the IJN was also developing highly capable land based naval aircraft—such units would destroy Force Z in 1941. The British knew they had to buy time for the Mediterranean Fleet and troops from India to get into theatre—the ‘period before relief’ (estimated in 1932 as 38 days). They had progressive ideas about this. Until well into 1940, the Royal Navy maintained a strong submarine force in the Far East. In 1939, this included 15 operational units, more than the combined total in the Home and Mediterranean Fleets. These boats practised wolf pack tactics in combination with RAF flying boats for the expected Japanese invasion convoys. In a precursor to the Cold War, they also conducted covert submerged intelligence gathering on the Japanese fleet in its own anchorages. One of Australia’s key failures was in going no further to develop the submarine flotilla it promised than the pair of boats commissioned in1927. So low did Australian defence spending fall that the RAN gave both submarines to the Royal Navy in 1931. There should have been six Australian boats blocking the deep water passages of the Indonesian archipelago, while British submarines operated in the South China Sea and around Japan. The Abyssinian crisis was the first nail in the coffin for the ‘Main Fleet’ strategy. By 1938, capability developments were hammering in more. Until then, the potentially hostile navies had not the number of modern ships to threaten Britain. German and Italian warship completions rapidly changed the balance. Until then, the Japanese Navy could only field on average three carriers and six battleships. This had been manageable. During 1938, these deployable numbers increased by 50%. They would increase by another 50%—with more powerful ships—by the end of 1941. The 1938 crises changed the British focus to Europe. After France’s collapse, holding on in the Mediterranean was a gamble based on the Japanese staying out of the war. But, in the circumstances of 1940, were there any options? That the ‘play’ should have been properly explained to Australia, that Australia should have worked out the consequences for itself—and that Britain and Australia should have done more over two decades for their own defence and for the support of the ‘Main Fleet’ strategy with sea, land and air units must be the real ‘lessons’ of the affair for us. James Goldrick is an adjunct professor at the ANU’s Strategic and Defence Studies Centre, an adjunct professor and a member of the Naval Studies Group of ACSACS at UNSW at the Australian Defence Force Academy, and a fellow of the RAN’s Sea Power Centre. This is the first of three posts commemorating the Fall of Singapore in February, 1942. Image courtesy of Wikimedia Commons.